Color trends in web design 2019 – which colors are right for your website? Does the color choice of a website play a role in keeping users on a site for longer and convincing them of the achievements of a company? The answer to that is as brief as it is astounding – it is yes. 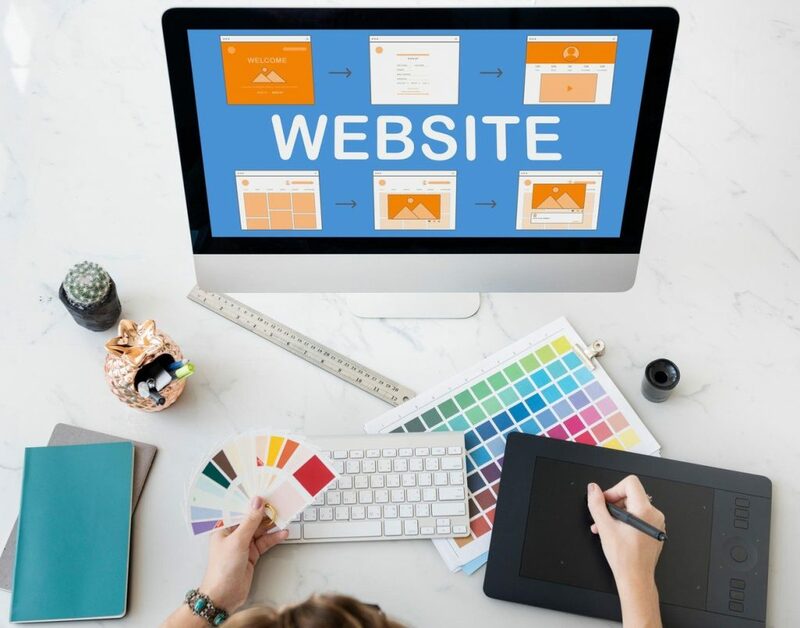 Innovative companies often test a variety of methods and techniques to find out how to increase conversions on their website. And one of the crucial factors is actually the color selection. For example, a young and promising start-up can attract the target group with bright colors. Because their contrast combination achieves an ideal visual effect and is perceived as dynamic and courageous. Meanwhile, there are valuable insights that can be used to influence emotions with the selection of the right colors. It is then the job of professional designers to apply this information as precisely as possible in their work when implementing websites. Only then can they ensure that the atmosphere of a website matches the desired brand perception. Red is the most stimulating color. Prolonged contact with the color red even causes an increase in blood pressure. The color is often used for important announcements and warnings. So, if your website communicates a lot of preventative and educational information, we recommend moderate use of red. However, it’s better to use “milder” reds to avoid subliminal aggressiveness among users. The color orange stands for youth, energy, and movement. Orange as a base color underlines the dynamism and joy that a company is looking for – Fanta demonstrates it. Yellow is a universal, warm color. It conveys positive emotions without excessive sharpness. This color is the optimal solution for companies offering consulting services, for example. Green is associated with calm, positive emotions, moderate relaxation. The stable atmosphere created by this color is excellent for companies such as financial institutions or construction companies. Blue is synonymous with safety, openness, reliability. But beware of nuances: Light blue is traditionally associated with friendliness and the dark tints with heaviness and melancholy. Giants like Facebook and Twitter successfully use different shades of blue to create exactly the atmosphere they want. In 2018, experts and designers described ultraviolet as the trendiest color. This trend towards brighter colors will, therefore, be reflected in the design of websites, apps, and logos in the future. Most organizations whose corporate design allows the use of bright colors will jump at this trend when designing websites. This color choice is an example of breaking old patterns. Modern customers like vibrancy, optimism, and brightness so why not incorporate the colors that signal just that into your web design? For more interesting stories make sure to follow BehaviourExchange on Facebook! Find out which targeting method you should use in your B2C Christmas campaign! These are the brands millenials most frequently talk about! 0 Comments on "Color trends in web design 2019 – which colors are right for your website?"